I start itching when I think of wildflowers. I guess I was slow as a kid in linking cause and effect– wildflowers and chiggers– together. I would merrily gather an armload of Indian blanket and pink evening primrose in the field next door, and next thing I knew, I was covered with red dots that itched for a week. 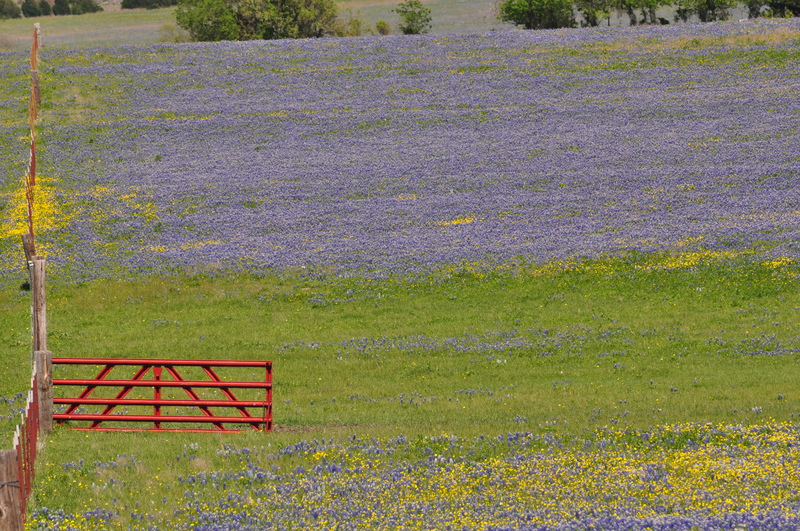 When we went traipsing through the fields in Ennis last spring, I didn’t sit in a bluebonnet patch for a picture. We just smiled—standing up. Well, it’s the season to dot roadsides. For us, that’s Midway Road. And we’re throwing not dotting. 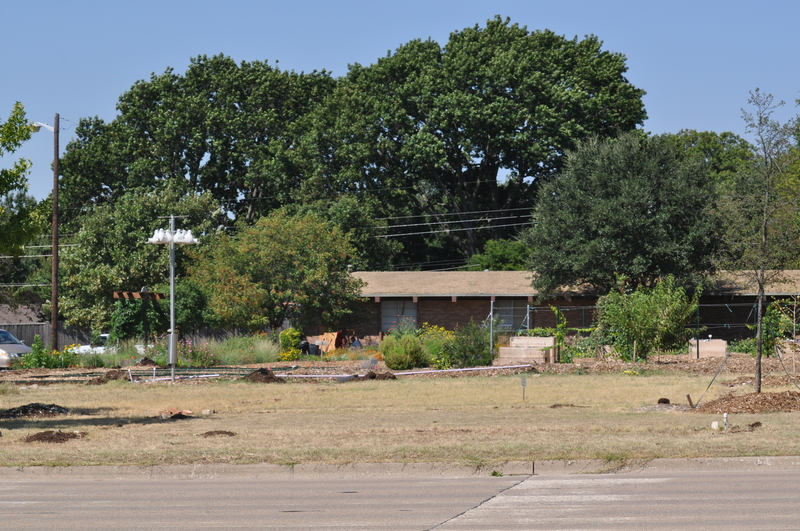 The Raincatcher’s Garden borders on busy Midway Road, a six-lane artery running north-south through North Dallas. 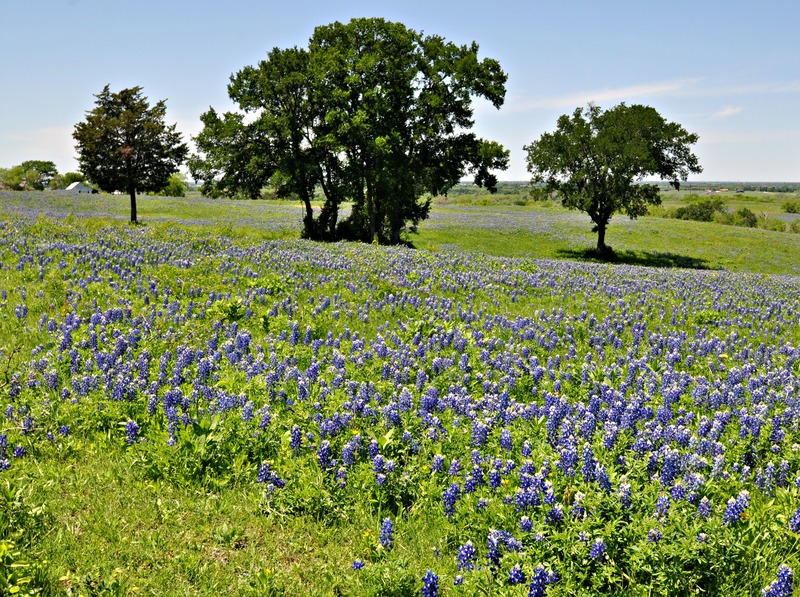 Next spring, about 20 feet of that boundary will be ablaze with “Texas-Oklahoma Native Roadside Mix” from Native American Seeds in tiny Junction, Texas. 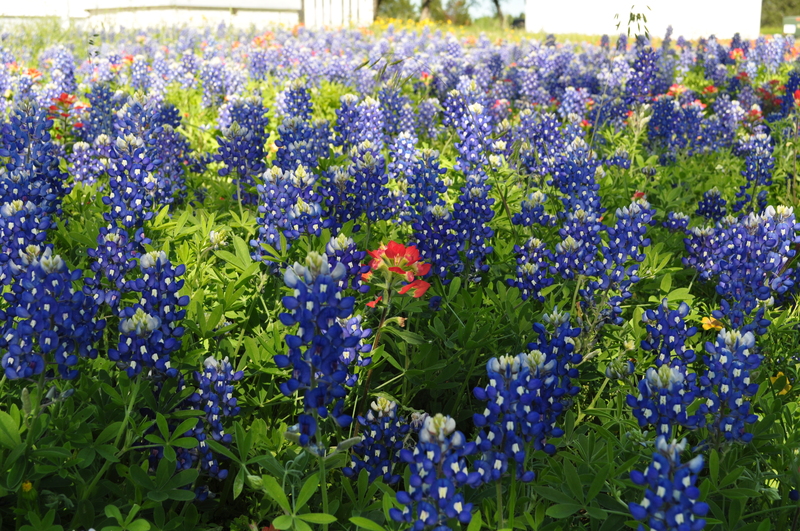 Texas bluebonnet, Indian blanket, greenthread, plain and lanceleaf coreopsis, purple coneflower, Mexican hat, winecup and Indian paintbrush plus a few more are in the mix. Looking Across Midway Road of The Raincatcher’s Garden, Wildflowers Spring 2016! Planting in the fall gives seeds a chance to sprout or break seed dormancy. Some seeds need a chilling period (cold stratification). Others have a hard seed coat that needs to be worn down (scarification) before they can germinate. Following nature’s schedule gives seeds a chance to be ready for spring’s warm temperatures and rain. The first step to spring wildflowers is to simply mow the existing vegetation as close to the ground as possible. Think scalping, but in the fall. Then take a sturdy metal rake, and pull aside the thatch for the compost pile. You want to have bare spots. Again using the rake, lightly till the surface of the soil no deeper than one inch. Any deeper, and you’ll disturb dormant weed seeds which could sprout. Smooth the area, again using your rake, and remove any leaf litter or debris. Rustle around in the garage and find an adjustable, hand-carried mechanical seeder. Some species have small seeds that are hard to distribute evenly; paintbrush and bluebell seeds look like fairy dust. To scatter the seed, mix one part seed with four parts damp masonry sand, coffee grounds, perlite, potting soil or other carrier. Broadcast half of your seed/sand mixture in one direction. Refill your spreader and sow the other half in a direction perpendicular to the first sowing. Happy seeds must get cozy with the dirt. The soil helps the seeds retain moisture for germination. The seed should either rest on the ground or at most be gently tamped down with a light stomp. Any more than 1/8” deep, and the seed may not have the energy to push through the dirt. Some of the seeds will be visible. Opinions differ as to watering the seed. Some experts leave water up to the fall rains. Others, like butterfly expert Geyata Ajilvsgi, lay in soaker hoses. At the Raincatcher’s Garden, we’re going to try a little of both. 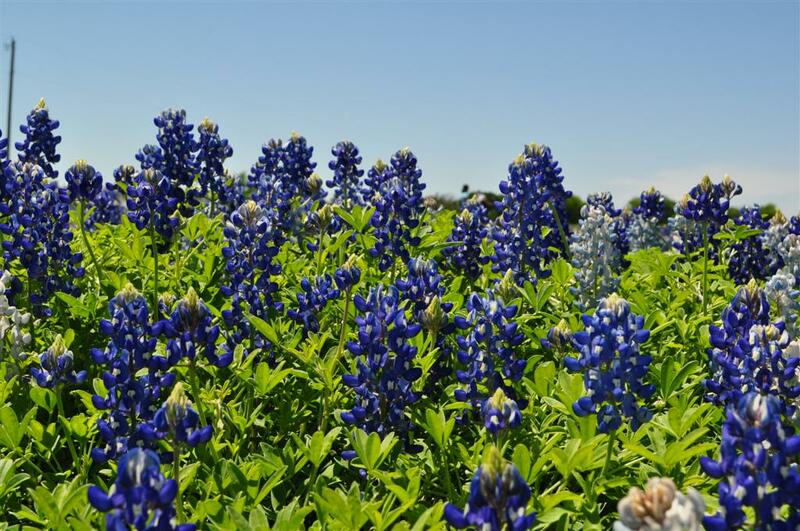 Our new sprinkler system will be set to water the first few weeks to keep the newly planted soil from completely drying out, as suggested by the Lady Bird Johnson Wildflower Center. As it gets cooler in the fall, the time between waterings can be longer. We’re also going to plant some wildflowers outside of the sprinkler spray, and see if the fall rains are sufficient for growth. Wait until at least 50 percent of your wildflowers (of each species) have dropped their seeds before mowing in the spring. Use the highest setting on your lawnmower when mowing to keep from damaging emerging seedlings. The Raincatcher’s Garden is getting some help planting wildflower seeds for next spring. Fourteen students in the Episcopal School of Dallas primer class have learned the story of Miss Rumphius, whose grandfather traveled the world and retired by the seashore. He asked his granddaughter, Alice (Miss Rumphius), to also travel and settle by the sea—and had one more request. He asked her to do something to make the world more beautiful. Miss Rumphius gathered lupine seeds and scattered them along the Maine coast, as our visiting students will do with wildflowers along our roadside planting. They have mixed wildflower seeds with clay into little balls and will throw them on our wildflower area. Former first lady Lady Bird Johnson, who worked tirelessly to preserve America’s natural landscapes, would be thrilled. Posted in Water Wise and tagged Lady Bird Johnson Wildflower Center, Midway Hills Christian Church, Texas Oklahoma Roadside Mix, The Raincatcher's Garden, Wildflowers of Texas. Bookmark the permalink.